Uncover the secrets of the amazing Hollownest. With many websites offering ways to crowdfund your project, more and more games appeal to this method to totally or partially fund their game. To have a fantastic campaign, many companies show images and even release an alpha version of the game to make potential backers fall in love with their ideas. One of the many games that I discovered through Kickstarter was Hollow Knight, but the campaign had already finished and the game was successfully funded with 4 additional stretch goals being reached, one being a Wii U port. After a little bit more development time, the game finally released on PC in February of 2017, but the Wii U port was eventually cancelled and a Switch version was promised. Storywise, the game doesn’t tell you too much. Your character is a knight on a quest to go to Dirtmouth and discover the secrets hidden in the vast Hollownest located below the city. The Hollownest is a once prosperous kingdom that fell into ruins with most of its residents dying or being overcome by The Infection that plagued it. 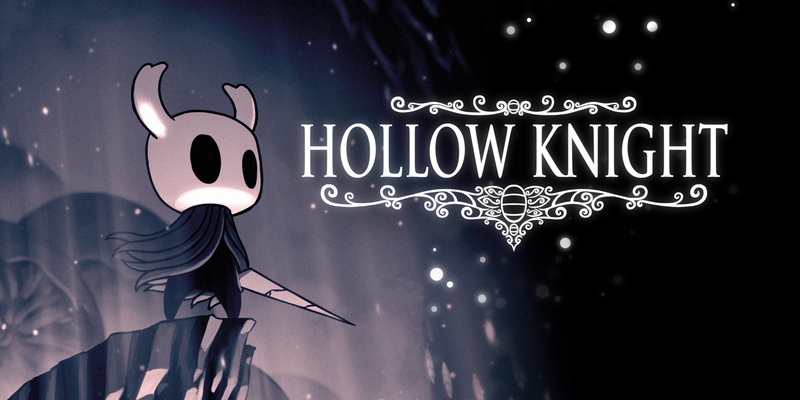 Now, that’s just the beginning of Hollow Knight’s story, but if you want to experience and understand it you will have to play while observing your surroundings, talking to every character available and finding its many secrets (some that even come from the expansions). If you don’t do that and just focus on finishing the game, you will probably just understand the surface of the story and will not experience the same impact it may have on others. After I saw most of it (there are just a few more secrets left to uncover), I have to say that it impressed me on how well thought out and exposed they are while also leaving some rooms to interpretation by the player. The first thing that you notice when you see this game for the first time is the unique visual style they went for. Through the traditional 2D visual, details pop up, characters and enemies designs feel unique and full of personality and the information you need to know is easily conveyed. But when you see it in motion is when you truly realize that they nailed the process. All the animations are fluid and they help you understand what is going on and even help you anticipate and avoid potential attacks. Just the fact that this game’s soundtrack was released on vinyl and that composer Christopher Larkin has around 70 thousand monthly listeners on Spotify (one of which is me), should be enough testament of the audio quality presented in this game. But even if you’re not convinced, I can guarantee that you will enjoy the vast variety the game has to offer. The entirety of my playthrough was experienced with the TV on a high volume or with headphones plugged in via handheld mode, so that I could experience and digest the music. The fact that even more tracks were added throughout the expansions, helped raise even more the high quality standard present in the game. That quality also shows in the sound effects as they will be essential to your adventure. They will help you understand if an attack is registered or not if there is an enemy targeting you, or even if Cornifer is near you. I also enjoyed the fact that the characters speak with a different humming sound that never got tiresome to hear. The real cherry on top though, is the gameplay. Just like every Metroidvania title, Hollow knight offers you a gigantic world that naturally unfolds as you play more and more. Exploring the area can feel confusing at first because you don’t have access to any map, but you will end up getting used to it and may even prefer to play this way when you get access to it. Even when you buy one map, it is only for that one area and it’s incomplete, so you have to explore in order to fully expand it. As you face powerful bosses and find secret locations, more abilities are presented to you and will expand your options to traverse this amazing world. A fun thing is that most of this abilities are teased as you explore, making even more satisfying to get and helping you remember where you can use them when you finally acquire them. Another neat point about the abilities that you unlock is that most of them also tie into combat. When you start your adventure, your movement and attack capabilities are limited and they expand to a deep enough combat system. I almost never had a complaint that I’d have to fight another enemy of a certain type or that I’d have to try a battle again with some of the tough late-bosses you will find in the main game and on the expansions. All I said applies perfectly to the main campaign, but can also be easily applied to each and all of the free expansions released for the game. They were almost perfectly fit into the original world, without requiring the player to start a file just for it. From the moment you start the game, they are all available into the Hollownest, but still need to be found, which can be a little hard in some cases. The first is Hidden Dreams, which introduced 2 new bosses with a new music each, an upgrade for the Dream Nail that allows teleportation to a position you set and a new hidden stag station. This may be the shortest of the 3 main expansions, but it introduced two amazing and hard boss battles and the dreamgate which is a function that was essential to my playthrough. The second is The Grimm Troupe, which introduced us to the troupe that names it and with so, we also got access to 2 new bosses, some new charms, enemies, NPCs and music. This was the hardest to find how to get access to, but once I did, I enjoyed everything it had to offer. While we waited for the final expansion, the game received the Lifeblood update, that added a new boss, some map markers and balanced the overall game so that we could have an amazing experience throughout the entire playthrough. For someone that played the game before this update, I can assure you it made the game even better. The final, most recent and biggest expansion was Godmaster, which introduced us to many new bosses, NPCs, enemies, music, areas and even 2 new alternative endings. This content is worth another dip into the game if you already finished and will provide a good challenge for you, while also making the actual version, the definitive one. Finally, I feel that the game lends itself well to the Switch, making it his home. The visuals and performance are clean in both mode and being able to play it on the go is a good way not to stop playing it. Also, some HD Rumble is nicely implemented, even though is nothing that will really be memorable. I’m going to be brutally honest, Hollow Knight isn’t 100% perfect, but I could write a thousand more words and still wouldn’t be able to express everything that Hollow Knight does so well, which captured my heart. I sank many hours in just one playthrough of it and still haven’t perfected it, but I will surely sink even more in subsequent ones (including the permadeath mode Steel Soul). When it comes to Hollow Knight, I simply can’t recommend it enough, especially if you like Metroidvania games and this is true for whatever platform you wish to get it for.